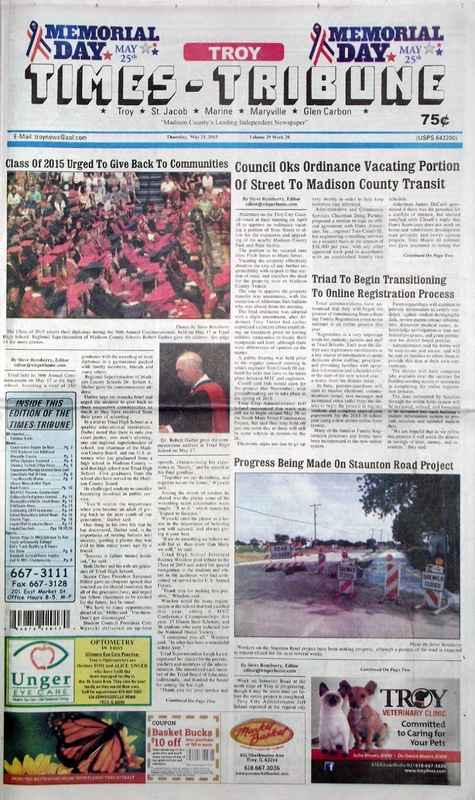 The May 21, 2015 issue of the Troy Times-Tribune is now available. Some of the stories in this issue: Council Oks Ordinance Vacating Portion of Street to Madison County, Triad to Begin Transitioning to Online Registration Process, Class of 2015 Urged to Give Back to Communities, Progress Being Made On Staunton Road Project, Maryville Fire Department to Purchase Hydraulic Equipment, Feature Story: Abusers Can Change by Making Better Choices in Their Lives, Baseball Knights Win Two of Three Recent Games, Triad Booters Reign Supreme in MVC Once Again, MCT Completes Heritage Trail Reconstruction Project, Ed Shafer Named to Illinois Aviation Hall of Fame; plus we have a full page photo spread on THS commencement ceremonies, police blotters, our “It Happened Here” history page, and lot more! The issue carries an obituary for Felicitas Korte.